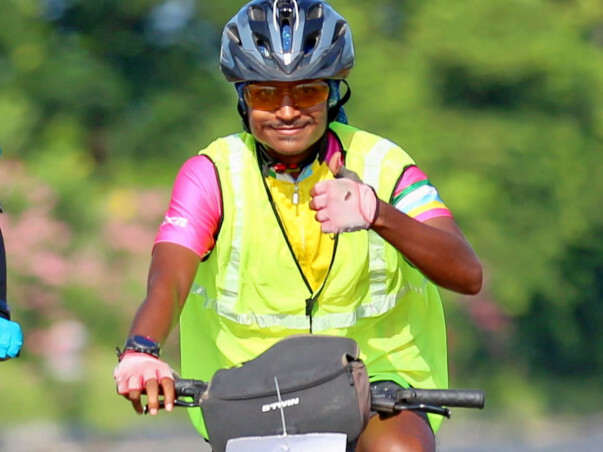 A Crowdfunding request for sponsorship to participate in the first Solo Unsupported endurance cycling by an Indian. Race Across Europe 2018. My self Sandeep 27-year-old hailing from Hyderabad. I am an Ultra-endurance cyclist since 2016. An Ultra-endurance cyclist is one who cycles more than 200 km at a stretch. I am also a Social worker and Volunteer. I have participated in numerous cycling events. I hold records for cycling 15750.63 km (India Tour) in 165 days and have a mention of this in the ‘High Range Book of World Records’. 'Vajra World Records' 'India Book of Records'. RANDONNEUR from Audax India in the year 2016. SUPER RANDONNEUR from Audax India in the year 2017. 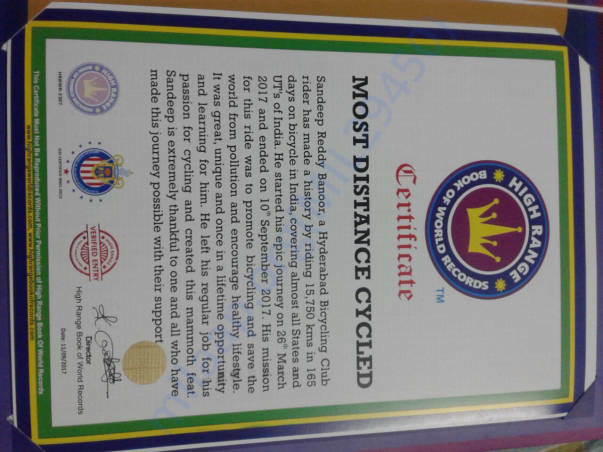 “MOST DISTANCE CYCLED” record from High Range Book of World Records in the year 2017. 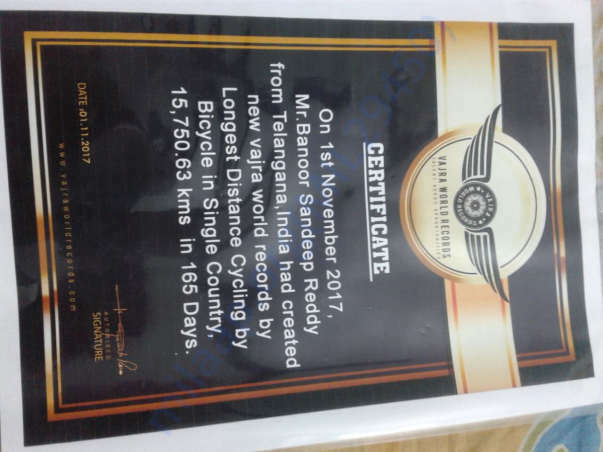 “LONGEST DISTANCE CYCLING BY BICYCLE IN SINGLE COUNTRY” record from Vajra WorldRecords in the year 2017. 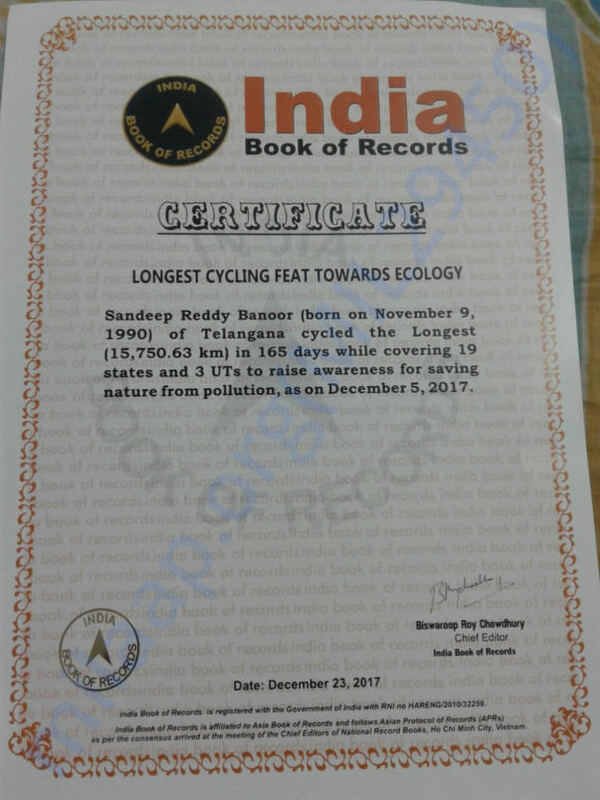 “LONGEST CYCLING FEAT TOWARDS ECOLOGY” from India Book of Records in the year 2017. “AWARD OF APPRECIATION” from Hyderabad Bicycling Club for making a history by riding 15750Kms in 165 days on Bicycle in India to promote bicycle for a healthy lifestyle and save the world from pollution. Awaiting the approval of GUINNESS WORLD RECORDS. While I can do the cycling part of RAE, there is a lot of support I need, and several of us could work together towards India getting this new Laurel. There are monetary and non-monetary elements. Monetary: The total cost for participating in the race is around Rs 10 lakhs. This includes Air tickets for the rider, hotel stays, Nutrition food, Bike, various Bike accessories. Non-monetary - Publicity and good wishes. Do start by sharing this project through Facebook, Twitter, and Email. Help me get enough collective good wishes to do my part - the actual cycling - with full steam.